This is the 8th Bergman I’ve seen. The man is a master of cinema and this film, while perhaps not his best, is a prime example of why. I’m strained to think of a filmmaker that can capture an existential crisis with as much class, thought, and the appearance of ease (I say appearance because I have no doubt that he went to painstaking depths to create such the illusion of “ease). One of the more fascinating aspects of this film is how the feeling of loss and isolation permeates thoroughly throughout the film. Despite a very sober, unflinching camera coupled with the lethargic progression of the film, staying largely confined to the church, like those islands Bergman is so fond of, the film has a largely violent emotional core of free falling and looking for something, ANYTHING to grab onto. It is a dense bleak walk through depression but what Bergman isn’t to one degree or another? I look forward to completing the trilogy when I witness “the Silence”. I expect it to enter into the “greatest trilogy ever” conversation as Before Sunrise/Sunset/Midnight just did earlier today. 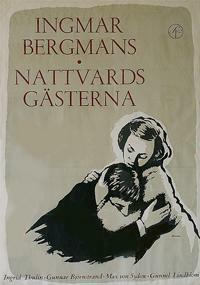 It is also worth noting that I’m very much a fan of how brief Bergman makes many of his films. His pace and tone feel far more earned because he is not merely padding time. Every shot, every scene, and every line matter. Once again, masterful.